New resin technology formulated to provide stronger bonds than polyester adhesives. Very light/white pearlescent colour making it ideal for invisible joints especially on light coloured stones. Perfect for seaming, laminating and chip repair on all types of natural and synthetic stones including dense granite. 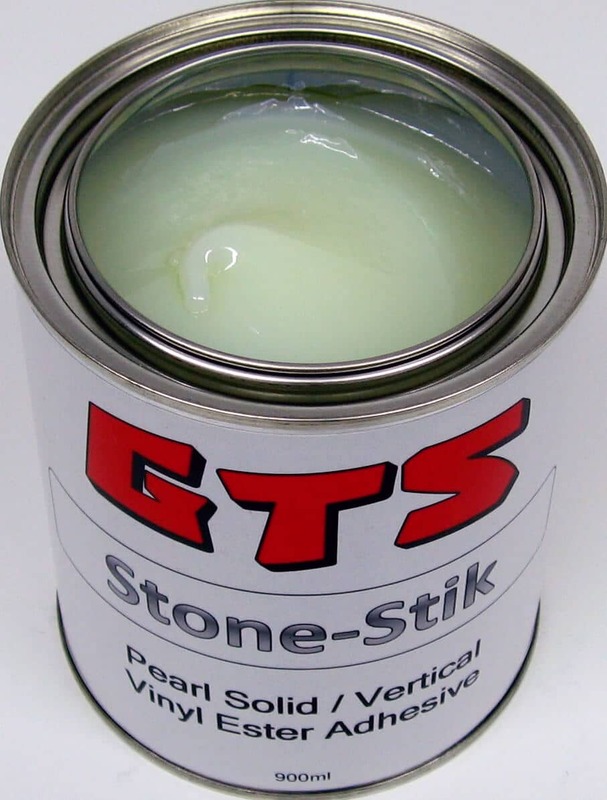 Light colour makes it easy to add GTS Stone-Stik Colouring Pastes for perfect colour matching. Uses white paste hardener (BPO) Important – Only use 1%-3% BPO by weight – Only use BPO supplied by GTS. Working time 3-5 minutes. Full, tack-free, cures in less than 20 minutes. Available in Pearl Solid/Vertical, 900ml tins (includes one white hardener paste).